What do Cleveland, Ohio and Columbia, South Carolina have in common? 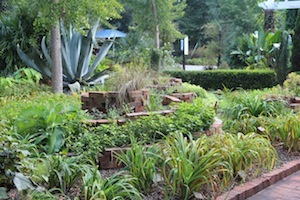 The Cleveland Botanical Garden supplied the inspiration for a raised brick garden bed for the Riverbanks Botanical Garden in Columbia. The project grew out of an idea from a show that Eric Johnson hosted. Diane Baker, Horticulturist at the Riverbanks Botanical Garden (Riverbanks Zoo & Botanical Garden), was able to use the inspiration she got from a GardenSmart television show she watched on ETV. 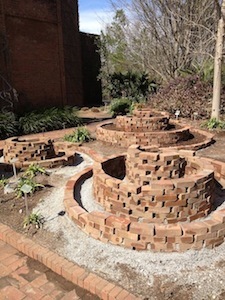 In this show, a gardener had constructed raised spiral beds out of used brick and then filled the beds with herbs. Diane had an area that needed to be redone and a large stack of extra bricks. She checked with Andy Cabe, Director of the Riverbanks Botanical Garden. 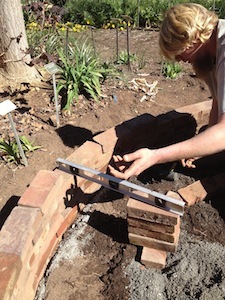 He gave the go ahead to construct similar beds near the Botanical Garden’s entrance. From the show’s inspiration, Diane constructed three spiral beds, “I took the single spiral and added 2 more to it, large, medium, and small. The largest being 8 feet x 2 ½ feet, medium is 7 feet x 2 feet and the smallest is 6 feet x 1 ½ feet. 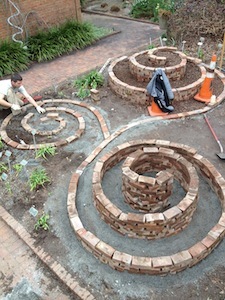 The beds interconnect and interact in a pleasing spiral pattern. “The spirals were completed in February, not the best time to find the plants I was looking for,” she said, “but I was able to find enough to plant until I could switch them out later in spring.” She moved the daylilies back into their new beds and planted Sedum ‘Mexicanum’ around the edges to reduce the public’s temptation to walk on the brick spirals. Later, in the Spring, she planted a combination of permanent evergreen plants like thyme (Thymus citriodorus ‘Lime’) and mints (Mintha x piperita f. citrate, and Mentha suaveolens), and Carex ‘Frosted Curls,’ filling in the open spots between herbs with annuals. ¹Crush-and-run (Crusher Run, Crush-n-run) A mixture of stones and stone dust that compacts and binds together to create a good base for bricks, pavers, or gravel.